It’s New Feature Week at Intense Debate! It wouldn’t be cool of us to slowly release these features over the next couple of weeks and deprive you of their incredible commenting power. So instead we’re just going to open the gates and release new features each day this week! Today’s new feature for the Intense Debate commenting system is the shiny new Subscribe Menu. 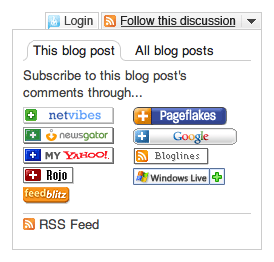 Now you can subscribe to comments through a variety of common RSS readers such as Google Reader, Netvibes, and Newsgator. Using our new Subscribe Menu, you can subscribe to either the comments of a blog post or to the entire blog. Plus there’s a direct link to the RSS feed. What do you think? Got any suggestions on the services you’d like to see in the Subscribe Menu? Are there some services that shouldn’t be there at all? Drop us a note at feedback@intensedebate.com, or post a comment below. Be sure to check back tomorrow to learn about additional new features.